Many of us think that using artificial sweeteners can help control the sugar cravings while dieting but a new study has found no such effect. 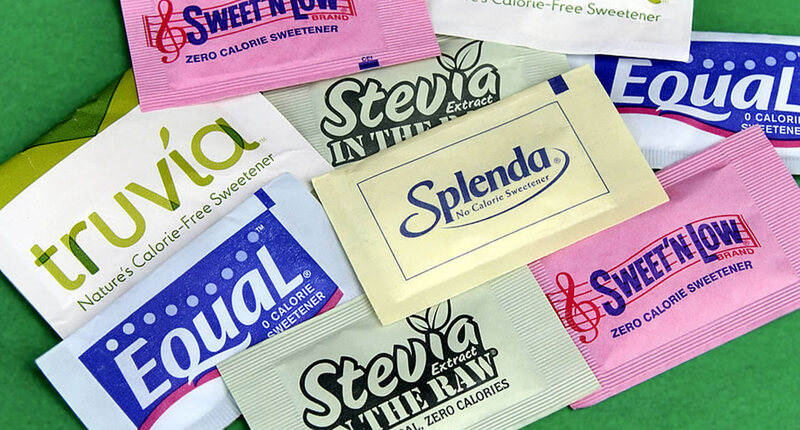 Despite popular belief, artificial sweeteners don’t suppress appetite, and trying to use them can lead to over eating and thus increased caloric intake later. Basically – if you’re dieting and have a glucose craving, artificial sweeteners are a poor choice. Instead of consuming those when your body’s waiting for calories and your glucose levels are dropping, the research (below) suggests you may want to use artificial sweeteners at times when your body’s less likely to become aware of the lack of calories. You can’t fool Mother Nature with artificial substances! When researchers blocked sugar receptors in mice, they found that, while the natural sugar glucose bound to the receptors despite the block, artificial sweeteners like those found in diet sodas were unable to bind to the receptors. The brain’s dopamine reward system responded to glucose but not to the artificial sweetener sucralose, as well. Remember, dopamine is the body’s reward system, so in essence, one can overindulge in artificial sweeteners due to the lack of dopamine response. Researchers also found that post-artificial sweetener ingestion, dopamine levels remained the same as pre-ingestion levels, which stands in contrast to the rise in dopamine levels after the mice had consumed glucose.